We start the story with a wayward princess named Jen who lives in Aerdem with her mother and father, the King and Queen, and her brother, Dash the prince (who is quite Dashing–if I may say so myself.) Jen came from the Plain World where she had lived most of her life with an old woman named Nell before being reunited with her rightful–and very royal–family here in Aerdem. Aerdem is a beautiful world full of colors beyond the imagination, magical wonders, and strange creatures. A.R. Silverberry paints vivid and realistic pictures for the reader that make you actually feel you are there right there alongside the characters. But there is also a dark evil that is penetrating the land. And along with many other lovable and–quite rightly–hate-able characters, Jen makes her journey through different worlds to find the key to saving her family, fighting off the evil, and setting things right in Aerdem. 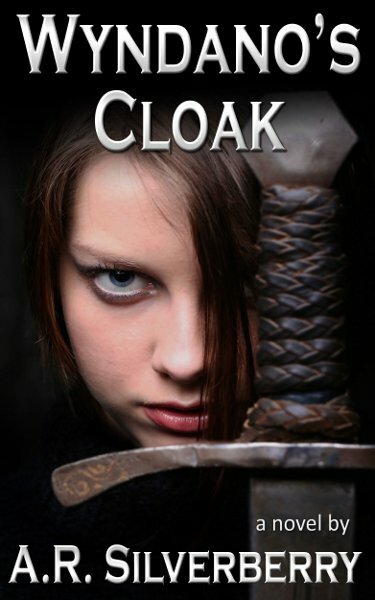 Will she ever be able to overcome her fear and seek the help of Wyndano’s Cloak? Throughout her story, Jen may overcome many obstacles–inner and outer–but can she find her true inner-self? Can she master the mystical Wyndano’s Cloak? You HAVE to read this book to find out. And trust me, you will not be disappointed. I would recommend this book to anyone who loves a good long fantasy. I actually would recommend this book to anyone, because it is that good. I give WYNDANO’S CLOAK by A.R. Silverberry a magical, mystical, and magnificent 5 stars! Please grab yourself a copy today. Here is where it is available. WAIT! There is more! I had the pleasure of interviewing the author of Wyndano’s Cloak. Please go here to check out A.R. Silverberry’s awesome interview! Thanks so much for reading my novel, and for inviting me to do an interview, too! Have a Happy Holiday, and a prosperous New Year!